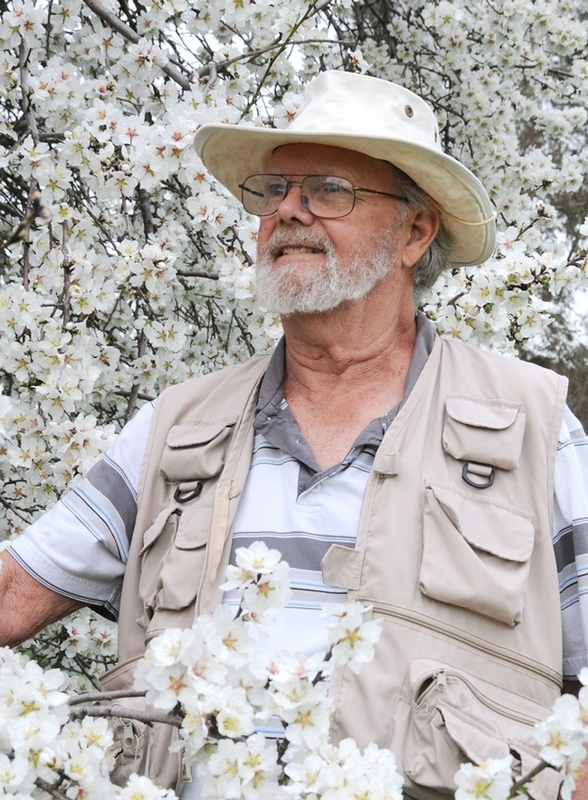 Native pollinator specialist Robbin Thorp is a distinguished professor emeritus of entomology at the University of California, Davis. He is the co-author of Bumble Bees of California: An Identification Guide (2014, Princeton University Press) and California Bees and Blooms: A Guide for Gardeners and Naturalists (2014, Heyday Books). Of the 20,000 bee species identified worldwide, some 4000 are found in the United States, and 1600 in California. He continues to conduct research on bees because he enjoys it. He monitors the bee population at the half-acre bee friendly garden, Häagen-Dazs Honey Bee Haven garden, located next to the Harry H. Laidlaw Jr. Honey Bee Facility on Bee Biology Road, UC Davis. He began collecting baseline data in the field before the garden was installed in the fall of 2009. To date, has collected more than 80 species of bees "and counting." 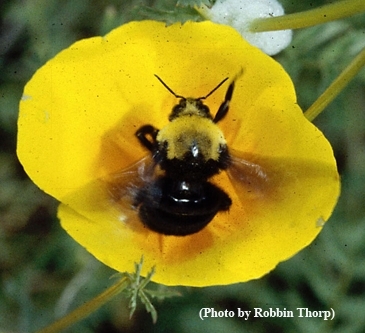 Robbin has long-term projects on the status of western bumble bees, on the diversity of bees on Santa Cruz Island, Calif., and on native pollen specialist bees in vernal pool ecosystems. He provides identification services for collaborators studying native bees as crop pollinators, habitat restoration for pollinators on farms, and urban gardens as bee habitat. Professor Thorp received his bachelor and master's degrees in zoology from the University of Michigan, Ann Arbor, and his doctorate degree in entomology from the University of California, Berkeley. In 1964, Robbin joined the UC Davis Department of Entomology faculty and conducted research on pollination of crops pollinated by honey bees, especially almond. 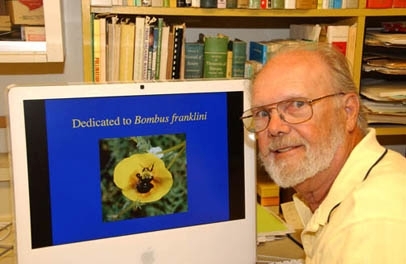 His research also included the use of other bee species in crop pollination, the roles of native bees in pollination of flowers in natural ecosystems such as vernal pools, and on the ecology and systematics of native bees. He taught courses in General Entomology, Natural History of Insects, Insect Classification, Field Entomology, California Insect Diversity, and Pollination Ecology. He served as major professor for 9 MS and 11 PhD students. He served on numerous other thesis and graduate exam committees at UC Davis and other institutions. He took two sabbatical leaves in Australia. He was elected a Fellow of the California Academy of Sciences, San Francisco in 1986. He is a longtime associate of the Bohart Museum of Entomology. He was honored for his work with bees when the Pacific Branch of the Entomological Society of America chose the team of Eric Mussen, Robbin Thorp, Neal Williams, Brian Johnson and Lynn Kimsey for its distinguished team award in 2013. They were honored for their collaborative work specializing in honey bees, wild bees and pollination issues through research, education and outreach. Their service to UC Davis spans 116 years. Robbin retired in 1994, but continues to serve on graduate student thesis committees and gives guest lectures. Since 2002, he has participated as an instructor in The Bee Course offered annually through the American Museum of Natural History, New York at its Southwest Research Station, Portal, Ariz. He is also involved with the management of the Jepson Prairie Reserve, a vernal pool ecosystem, and serves as chair of its Advisory Committee for the UC Natural Reserve System. He continues his research on ecology, systematics, biodiversity, and conservation of bees including pollen specialist bees in vernal pool ecosystems. He also is involved in research on the role of native bees in crop pollination, the role of urban gardens as bee habitat, and declines in native bumble bee populations.